Agence France-Presse (AFP) has release a paid-for application for the iPhone and iPod Touch. Costing $1.99 to download, the app will offer multimedia news reports from AFP in English, Spanish, Portuguese and German. Interestingly, the agency has also created a mobile opportunity for its clients with this launch. AFP customers can adapt the app with their branding and content – and French news org La Depeche du Midi as already done this with the launch of its iPhone app last week. This entry was posted in Mobile and tagged afp, Agence France-Presse, france, iPhone, paid content on January 12, 2010 by Laura Oliver. A friend recently went on holiday and emailed another of our friends an update: she had redefined the trip as ‘educational visit’ and now was enjoying it much better. I undertook a similar exercise at the theatre at the weekend: once I’d redefined ‘Breaking News’ as two hours (without an interval) of informative, rather than necessarily entertaining, activity, I was much more settled in my seat at the Theatre Royal in Brighton last Saturday. Rimini Protokoll is the German company (‘the sort of outfit that probably could come only from Germany’), except they don’t call themselves a ‘company’, which produces Breaking News, their latest ‘documentary’ theatre endeavour – visiting Brighton for its UK premiere. Good question from theatre critic, James Woodall, in his introductory notes in the programme. On this occasion, Rimini Protokoll have brought together eight international ‘news people’, all based in Germany, onto one stage, to live-interpret the news from their variously angled satellite dishes. The ninth contributor is an exception: Ray, from Ship Street in Brighton. Perhaps they found him in the Cricketers. 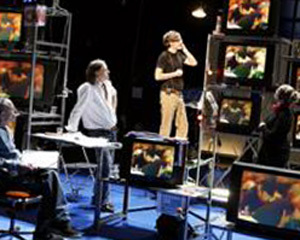 The company improvises in a ‘arrangement of stage spontaneity’ – and this is the first time it has been done in English – their reactions to, and interpretations of, the news on various international news channels that they consume at their individual televisions, or computer (in the Icelander’s case). Intermittently, they take turns to ascend a podium to read extracts from Aeschylus’ The Persions. Iceland likes a giggle during its news: The Icelanders take the end of the news bulletin ‘lollypop’ very seriously: for Saturday’s performance, we caught an item on the success of the Icelandic Symphony Orchestra’s Maximus the Musical Mouse. It’s very important that ‘you don’t leave your news audience depressed’, explains Simon Birgisson, who was once an investigative journalist for the DV newspaper. I was also tickled by Iceland’s TV channel history: its first ever station, Sjónvarpið, translated directly as ‘television’. Its second was called 2. Al Jazeera has its critics: Djengizkhan Hasso, a Kurdish interpreter, and president of the Executive Committee of the Kurdish National Congress, criticised the channel for its emotive use of language in some of its reports. He also added that it would be very difficult to perform a play like Breaking News in an Arab country. Hasso’s performance was particularly memorable for the role-play of the time he met George Bush. He told the other actors what they had to say, and they solemnly repeated it back, so the audience got each segment of the conversation twice. What counts as a high ‘alarm’ story for press agencies is very subjective. Andreas Osterhaus, a news editor at Agence France Presse (AFP) in Berlin said he raised such an alarm on the day of Benazir Bhutto’s assassination, but his colleagues thought he had acted a little hastily. Previous alerts included the Princess Diana car crash, the attacks on the World Trade Center in 2001, and the capture of Saddam Hussein. We also learnt that Sushila Sharma-Haque, who watches various Indian and Pakistani, as well as German, news channels, goes to bed at 10pm promptly. She did just this on the night of the performance, making at an early exit from the stage at around 9.30pm. She did, however, pop back to take a bow. This entry was posted in Events, Journalism and tagged Agence France-Presse, and president, Andreas Osterhaus, angled satellite dishes, Benazir Bhutto, Berlin, breaking news, car crash, Executive Committee, George Bush, Germany, Iceland, Icelandic Symphony Orchestra, interpreter, investigative journalist, James Woodall, Lyn Gardner, media-orientated 21st century, National Congress, news editor, Princess, Rimini Protokoll, Saddam Hussein, Simon Birgisson, Sushila Sharma-Haque, theatre critic, United Kingdom, World Trade Center on May 14, 2009 by Judith Townend. Reuters, Associated Press (AP) and Agence France Presse (AFP) will not cover matches, training sessions and events for cricket in Australia, because of ‘unacceptable accreditation terms’ set out by Cricket Australia, the sport’s governing body in the country. Reuters partner Getty Images will provide images and ‘fulfil their commercial obligations only’ e.g. not providing any editorial of the matches. “As in previous instances, this decision [the accreditation terms] compromises our ability to report independently and objectively, and comes at the expense of global fans and sponsors,” said Christoph Pleitgen, global head of News Agency for Thomson Reuters, in the release. This entry was posted in Legal, Online Journalism, Press freedom and ethics and tagged Agence France-Presse, Associated Press, Australia, Christoph Pleitgen, cricket, Cricket Australia, Getty Images, global head, New Zealand, News Agency for Thomson Reuters, News Media Coalition, news services, non-sports magazines, online coverage, online coverage including, reuters, South Africa, thomson reuters on November 18, 2008 by Laura Oliver. 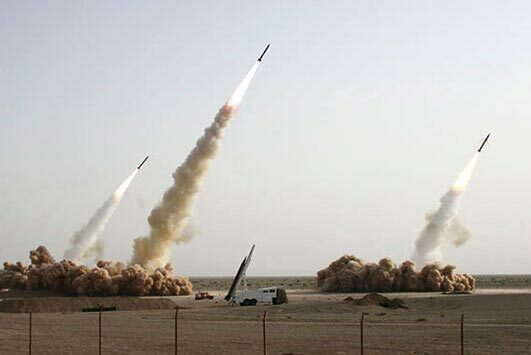 Agence France-Presse (AFP) has retracted a photo of Iranian missile tests published this morning, stating the image had been ‘apparently digitally altered’ by Iran’s state media, the New York Times’ Lede section reports. It was too late for the print editions of the LA Times, Financial Times, Chicago Tribune and others, who ran the pic on the front page, and for the BBC, New York Times and Yahoo News websites. According to the Lede’s report, the agency said the fourth missile may have been added to mask a grounded missile that failed to launch during the test. 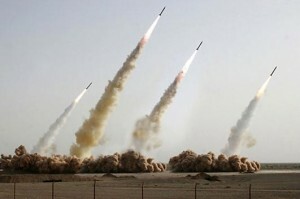 This entry was posted in Photography and tagged Agence France-Presse, Associated Press, BBC, Chicago Tribune, Financial Times, Islamic Republic of Iran, LA Times, New York Times, state media, the LA Times, the New York Times, Yahoo on July 10, 2008 by Laura Oliver. Wikileaks – the whistle-blowing website forced offline two weeks ago – has been restored by a US federal court judge, Agence France-Presse (AFP) reports. Overuling the closure, Judge Jeffrey White said he was concerned about issues of freedom of speech and the ‘effectiveness of disabling the wikileaks.org domain name’. This entry was posted in Citizen journalism and tagged Agence France-Presse, federal court judge, Jeffrey White, judge, United States, wikileaks.org on March 5, 2008 by Laura Oliver. 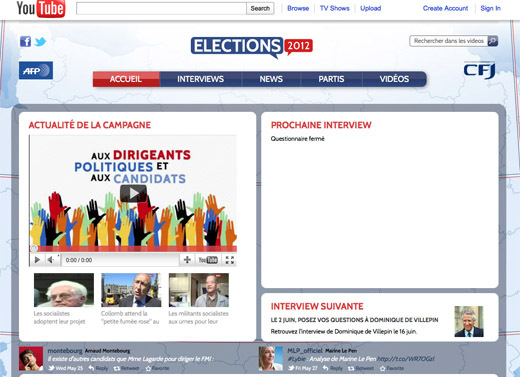 A video from French citizen journalism website Citizenside is expected to generate €100,000 (£75,285) of revenue after being sold to Paris Match, the Editors Weblog reports, with a commission rate of between 50 and 75 per cent going to the amateur creator. The footage from Citizenside, which recently signed a partnership with Agence France-Presse, was of the newsworthy former Société Générale trader Jérôme Kerviel signing a statement at a police station, according to the report. This entry was posted in Citizen journalism and tagged Agence France-Presse, amateur creator, EUR, Europe, GBP, Jérôme Kervie, journalist, Paris Match, Société Générale trader, trader on February 1, 2008 by Laura Oliver.